thanks, now the problem have been solved. that because the maxlen for one part of sms, i set it 150, it's too small, now it has been up to 300. , you can view the sms completely. update the source please, r1223. and compile it by yourself. - There are no icons for EMS (2 or more segmented sms) - 5B3 (unread), 5B4 (read) in ELKA, 5DF, 5E0 in NSG. Can you show it for such sms as well? - ems-attachments and mood ?? A translit option converts only first 257 symbols. What about last scroll line, BingK? IMHO it's not critical, isn't it? Tried translit for 257 symbols error... Unfortunately, if text is more than 257 chars, after translit it will be shortened to 257 Need fix. windes Benlux and SimaFish became of user-class due to this topic. now yor problem in page5 has been solved. the reason is that the mistake in 7-bit sms decoding. support to read the not full received sms, but it can not been auto save as file, and auto set status, and you can delete it by your hand. BingK, would you be so kind & compile NSG release of the latest version? 2 Benlux: do you have smaller icons for NSG? - there is some *.png in it's Img folder. Could you lay out the latest version for ELKA? And could you make sli blink once a second? Thanks a lot! And, it would be good to put there a full pack "all-in-one"
Where to put PNG's for this elf? 1.allow to open lots of notify pop-up window. 10.new way to get if there is new sms. 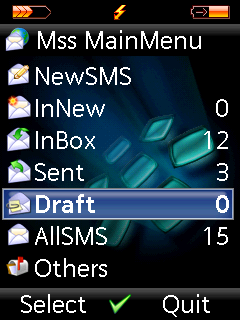 12.support to read not full received sms, but it cann't be set status and auto save as file, and you do that by hand. update,r1232, fix, update sms data list. if you don't want icon for the option menu, please add "WITHOUT_OP_ICON" to "Project/Options/C C++ Compiler/Preprocessor/Defined symbols", and recompile. If someone has a fullpack of needed icons, it would be a great idea to lay it out here! Thank you, BingK, for the great elf! And I'd still like to make SLI a bit different, I mean that I want a green light to blink once in a second because non-stop lighting doesn't look well.. Merci! Sorry that I write two posts together one by one, but I forgot to mention one participal idea and that would be adding an icon to iconbar. It is very actual on ELKA because we are used to that icon from the native browser and that would be nice if something stayed as earlier! In v2.0 2008.11.02 I can't open mss-files neither with MssLinker.elf nor with MySMSYS.elf. I previous versions there wasn't such a problem. sorry for that stupid mistake. 3.delete the new-sms-icon-path setting in MySMYS.bcfg, use img\dis_smsnew.png or the default icon from firmware. Thank you for realizing a good SLI-blinking. Still wanted to be added an icon of the new sms to the iconbar, I think that wouldn't be hard for you to make it up. And is it possible to make vibration kind of different way? I mean something like beats or rythme? Thanks for innovations a lot! BingK, can you find (or do you know) function to show icon on screensaver's background? Just as usually for calls and messages in phone.